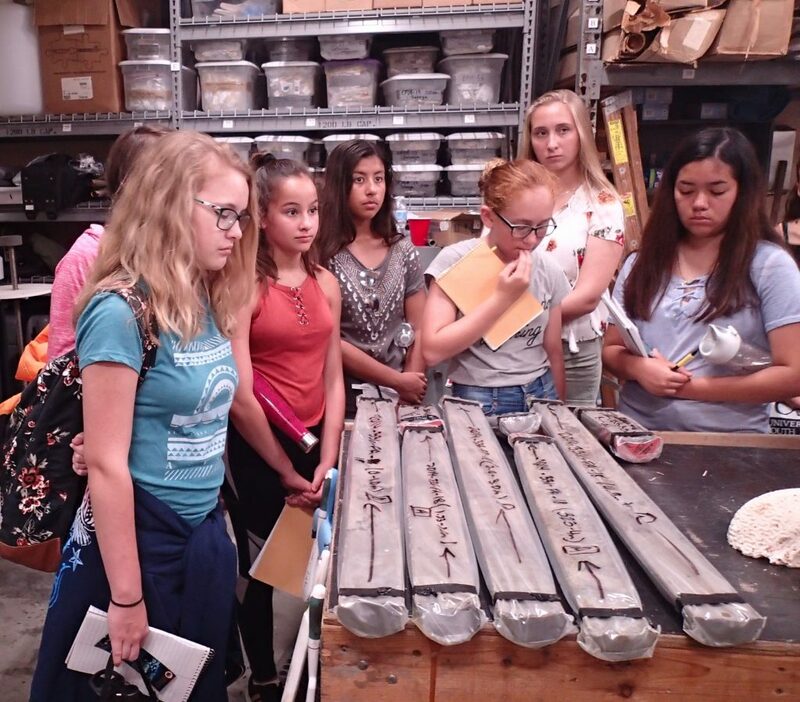 ST. PETERSBURG, FL – The 27th annual Oceanography Camp for Girls (OCG) drew to a successful close on June 27th, 2018, as the campers—girls moving up to the 9th grade—gave their final project presentations in the Karen A. Steidinger Auditorium at the FWC-FWRI building in St. Petersburg, Florida. 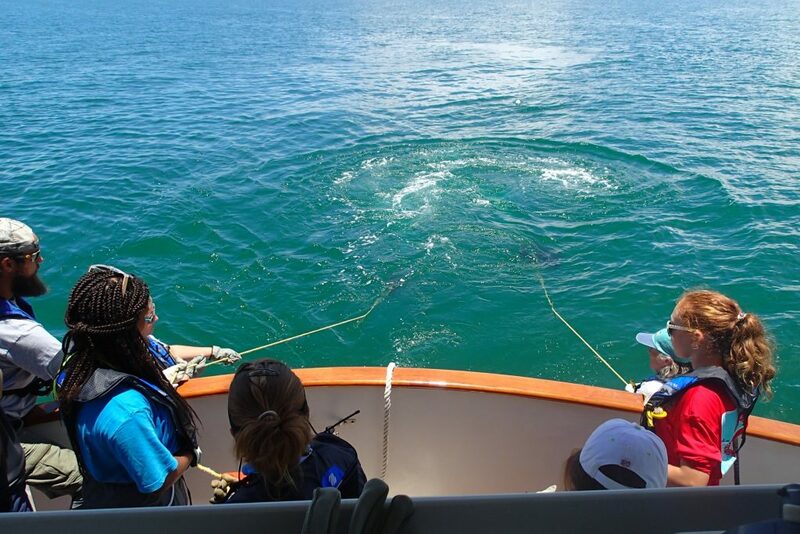 Every June, campers spend three weeks with their counselors, mentors, and camp directors learning as much as they can about oceanographic and marine sciences before presenting their own findings and taking a celebratory (and educational) trip to Sea World the following day. The 27 campers in this year’s program were guided by nine counselors (previous campers who are now high school students going into their Junior or Senior year), one senior counselor (an undergraduate student attending New College), 12 science mentors (current and former graduate students from USFCMS), and three camp co-directors. 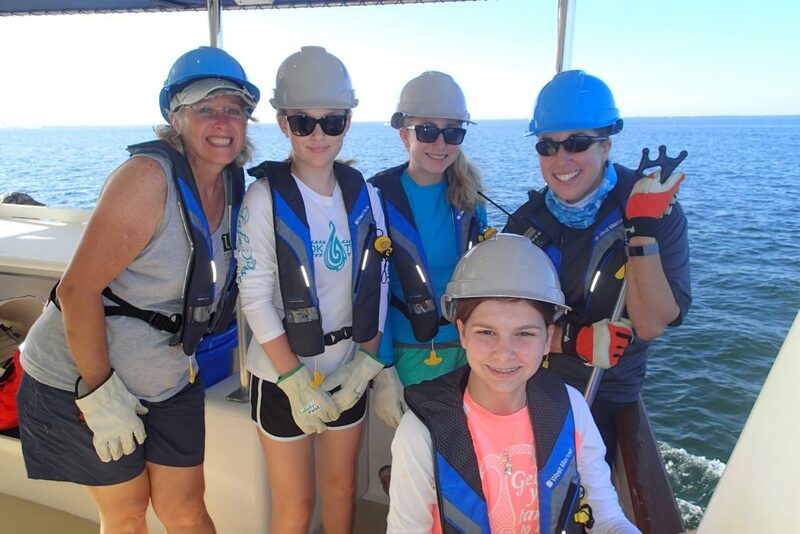 The natural environment of the Tampa Bay region was their laboratory for most of the three weeks as they explored the ecology of Clam Bayou, Shell Key Preserve, Ft. Desoto, Caladesi Island, and, from aboard the R/V ANGARI, the waters of Lower Tampa Bay. 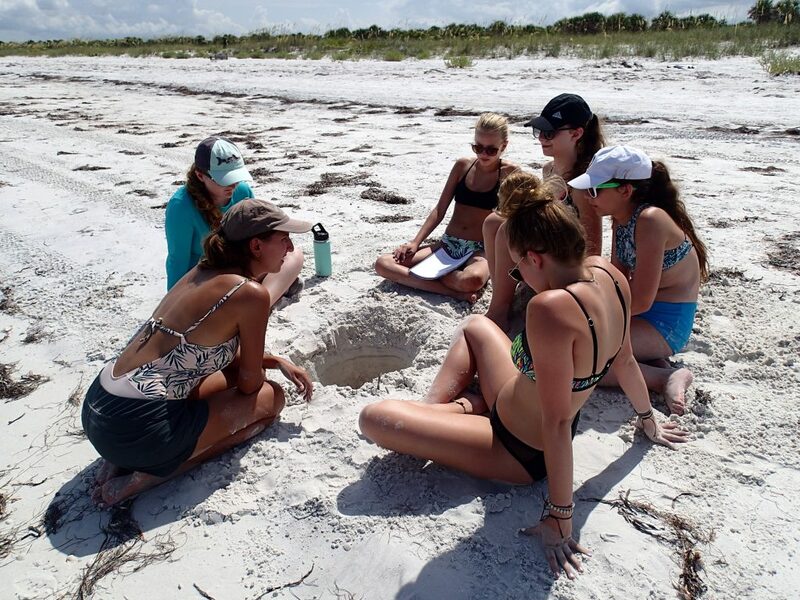 “Every single field trip is designed so the girls can experience the science of the ocean and then conceptualize and apply it,” explained Kate Dubickas, USFCMS graduate student and camp mentor. Former Dean of USFCMS, Peter Betzer, realizing that a lack of female faculty members within the college was a deterrent to the diversity of science that could be produced by the college, encouraged the formation of the camp and has been instrumental in seeing it thrive. 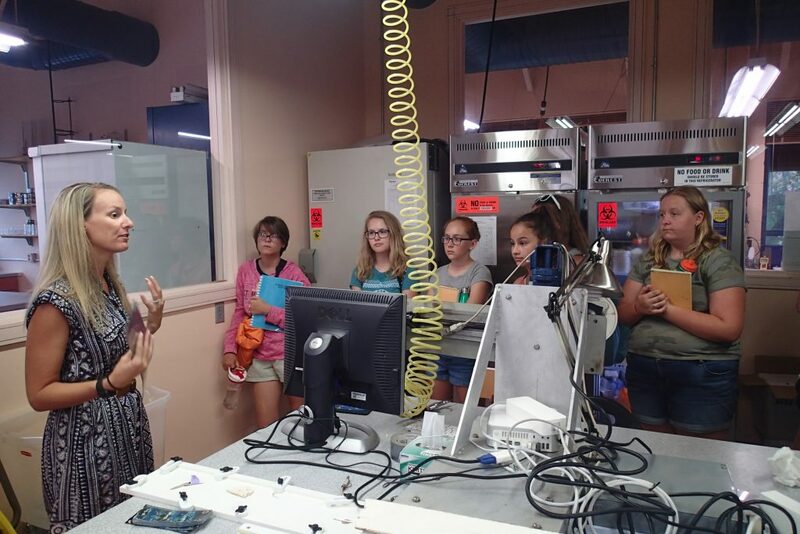 As part of the camp curriculum, Career Day offers the girls a chance to learn one-on-one from female scientists working at USFCMS or at one of the marine agencies surrounding the college in St. Pete’s Ocean District (NOAA, USGS, SRI, and FWC-FWRI). The camp staff are equally important figures for the campers to probe with questions. As the campers interact with the leaders over the 3-week period, there is ample opportunity to ask them why they chose science and what makes them passionate about their work or research. The graduate student mentors, especially, are prime examples for the girls to look to as young professionals making the transition from school to career. Benefits of participation in the camp certainly go both ways. 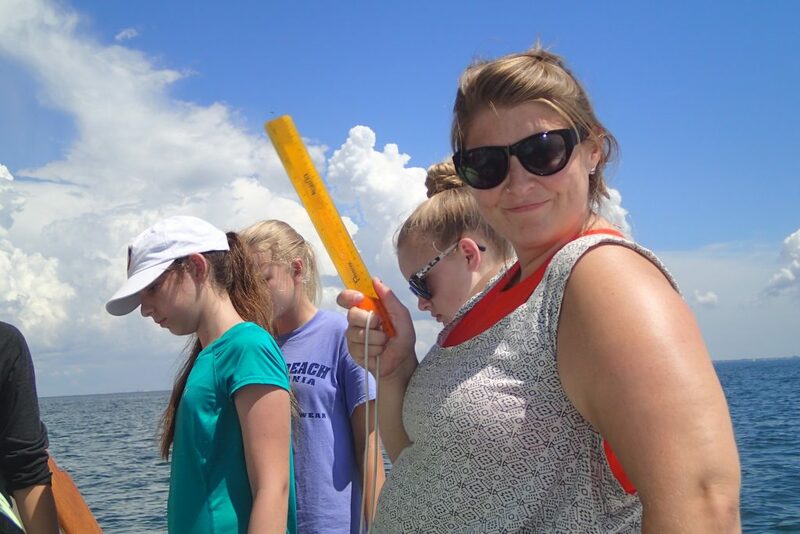 And being an 8-year veteran mentor for OCG has certainly enhanced Ross’ instructional skill set, which includes teaching at the collegiate level and leading a summer course on whales and estuaries for gifted and talented middle and high school students. Read more about the importance of OCG to Ross’ motivation and professional development. Age 14 is in the middle of an important developmental stage and the camp was created for girls graduating from the 8th grade for specifically this reason. For some of the girls, this is their first time to really step out and see what they’re capable of when asked to meet the challenge of completing a complex project and to take ownership of their work. “We’re there as mentors, but I feel like our role is mostly as facilitators. Really, we’re there to make sure [the girls] have what they need to do what we’re asking them to do. And then we just stand back,” said Ross. “It’s really amazing to see them discover that they can do something, or discover what they might have already heard in a traditional classroom setting. Then they actually go and do it and they’re like, ‘Wow!’” shared Cockrell. And what they do during the camp can have a real influence on their future career paths. The science of climate change has been a part of the camp curriculum for several years, but, according to the mentors, the focus on this issue is increasing. Scientists have indicated for decades that global warming might lead to an increase in either the frequency or intensity of hurricanes, and possibly both. Hurricane Irma, which wreaked havoc in the Caribbean while only glancing the Tampa Bay area, left a few teaching points behind. Studying the sediment layers in a pit dug for the campers on Caladesi Island, Dubickas proposed to her fellow OCG staffers that the campers should “see how nature remembers Irma.” Sediment layers within barrier islands, for example, might indicate heavy storm activity by the presence of layers of organic material from wrack lines deposited on the beach by the storm waves. This teaching point would later be stressed to the girls during the field trip lesson. Relating current topical events to what the girls see and touch during the field trips is an important aspect of the experiential learning format that is core to the camp. 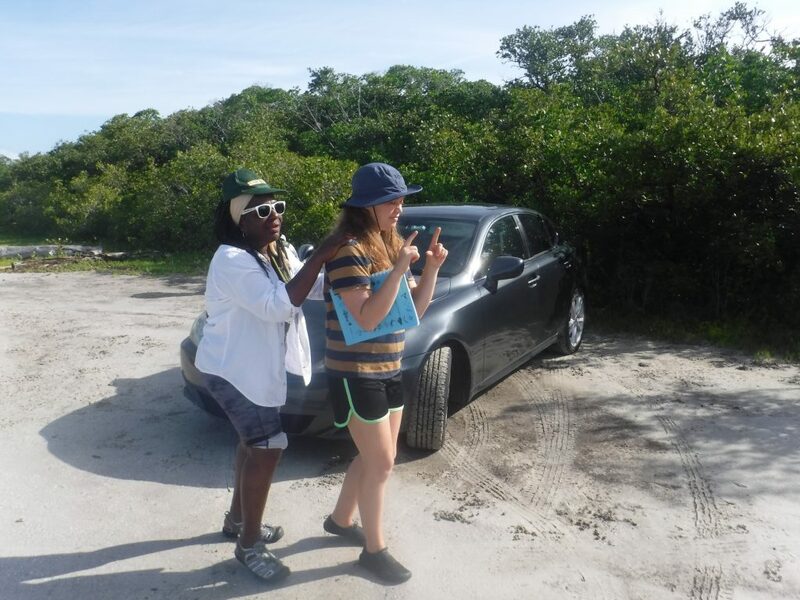 Field trips delve into the geology and ecology of barrier islands and the ecology of fishes, mangroves, and seagrass beds. The natural history of Tampa Bay, and importance of conserving our local ecosystem, is stressed in every lesson. “Be a good steward – leave the environment better than how you found it” is a common refrain heard during the camp. 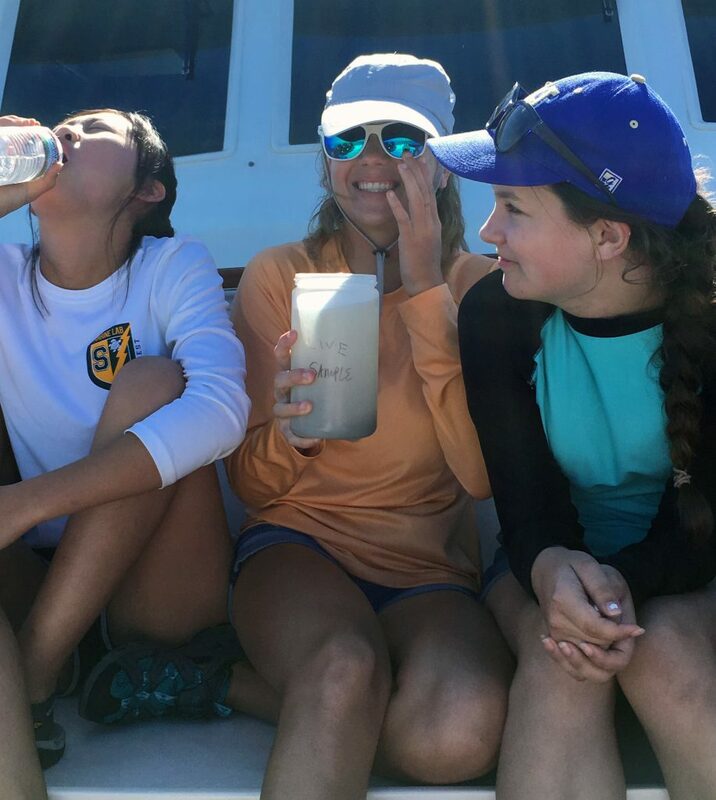 Girls also learn about how development and urbanization in Tampa Bay impacts the ecosystem and what they can do in their everyday lives to be good stewards of the environment, like reducing their consumption of single use plastics. This past May, former OCG participants rolled up their sleeves to remove trash from the water, shoreline and wooded areas of Clam Bayou, a clean-up event hosted by Duke Energy. “[Oceanography] is taught to the campers by them doing everything…They are collecting samples, they’re collecting the data, recording their data, analyzing the data, making posters and presentations on the data…They’re on the cruise. They’re really involved in everything, and we try to expose them to a wide range of things that, not just oceanographers, but scientists do more broadly,” said Cockrell. A good portion of the experiential learning process occurs in the laboratory—actually, multiple laboratories on the campus of USFCMS, USF Health, and Clam Bayou Marine Education Center. The girls are split into two groups and participate in research in the following lab activities: ROV building, Medical Research, Optics and Remote Sensing, Beach Profiling of Caladesi Island, Fisheries Management and Marine Protected Areas, Fish Ecology, Ocean Chemistry, and Electron Microscopy. 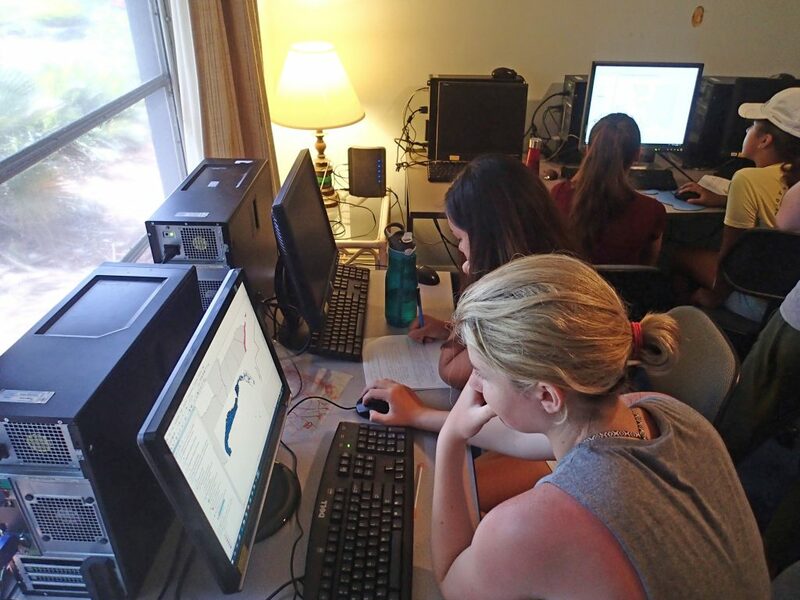 In one of the new labs added this year, led by Dr. Cockrell and fellow science mentor Kelly Vasbinder, campers are given the chance to work with ArcGIS (ESRI) and NOAA’s Gulf of Mexico Data Atlas. The girls first choose a problem to solve that requires balancing multiple competing priorities. 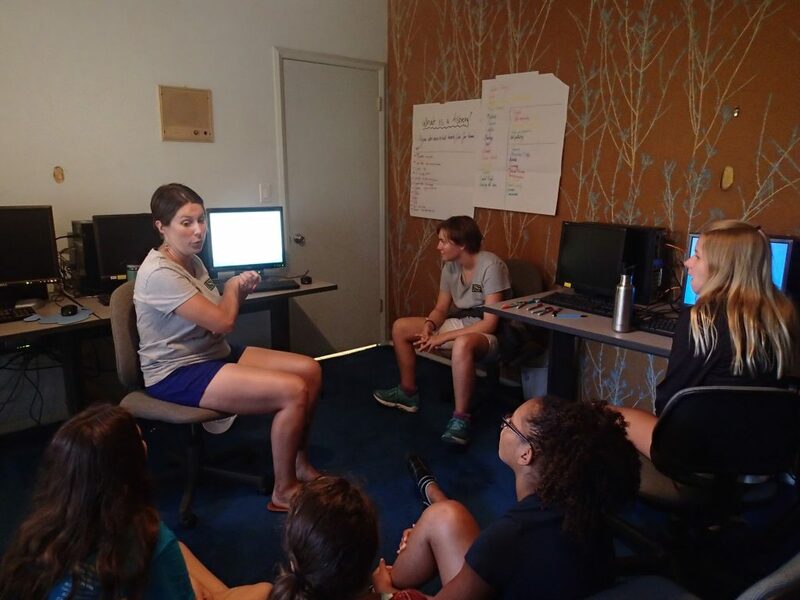 Then, handpicking a few of the many biological, physical, and chemical data sets offered in the Data Atlas, the girls are able to layer them using ArcGIS and perform some spatial analysis techniques to locate an area that best exhibits where they would choose to place a Marine Protected Area. Some of the revelations are more day-to-day. While one group was aboard the plankton cruise, another was across the bay at Ft. Desoto studying mangroves and shallow estuaries. A squall began to develop over Ft. Desoto and the portion of the horizon grayed out by the rain became apparent from the girls’ perspective on the boat. One of the girls on the cruise remarked, “Wow, I never really thought of rain clouds being that way.” She had casually assumed that if it’s raining, it must be raining everywhere in the surrounding region. Seeing the dramatic contrast between the skies over Ft. Desoto and her location on the boat gave her a deeper appreciation of weather and the rain cycle. One camp experience that demands to be told is the “Plankton Chug.” As part of the R/V ANGARI cruise through Tampa Bay, the participants put the finishing touches on their plankton and nutrient analysis by chugging seawater concentrated with plankton from the back end, or Cod end, of a plankton net tow. 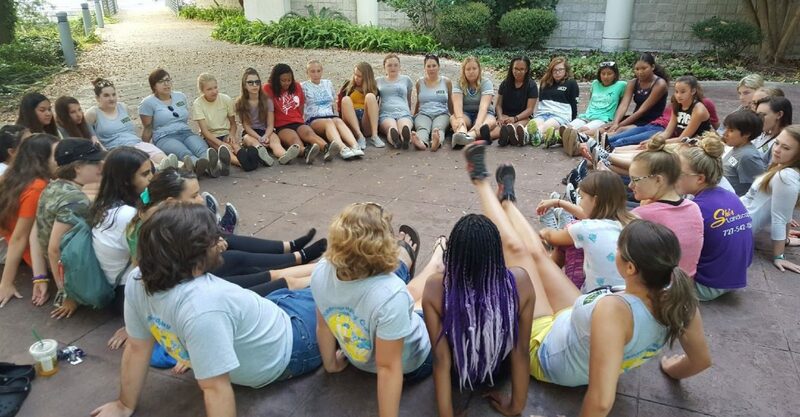 While this unique activity is not mandatory, every girl enthusiastically joins the circle, and either chugs or gets a kick out of watching fellow campers do it. Read about some other fantastic memories from the camp on the OCG blog. While the girls did learn about coastal geomorphology, complex ecological interactions, ocean chemistry, microbiology, and remote sensing, to name a few, the most important thing they learned might be how to build their own confidence through accomplishments and social growth. Fostering friendships, breaking out of cliques, and working as a part of a team are skills that the girls learn from Day 1. It seems as if the camp is designed as much for the development of the camp staff as it is for the campers. “It is difficult to not learn and grow at OCG,” shared Lodge. Much of this camp is made possible by the generous donations of Duke Energy, allowing the camp to remain free for all participants, thereby preserving the quality of the young ladies selected and allowing for a unique and diverse group of campers each year. Dr. Marcy Cockrell, camp mentor and recent USFCMS grad, gives a lesson on utilizing online data sets and mapping tools. 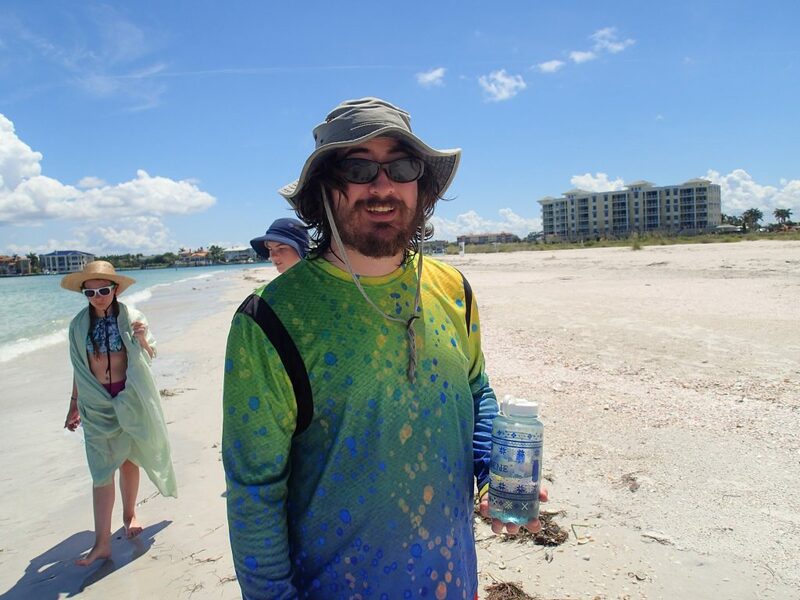 Camp mentor and USFCMS graduate student, Benjamin Ross, preparing to instruct campers on the flora and fauna of Shell Key. Read more at the OCG website and on their Facebook page.